Are you ready for the upcoming season of Farmer’s Market’s?? Soon the season will be here where in our communities the markets will be getting under way! I have been working solely on children’s items the last few weeks to prepare for the art walk here in town… I was so ready to move on to something new… Something I had never made in my crochet career. I wanted to make something quick and easy, no pattern required…. 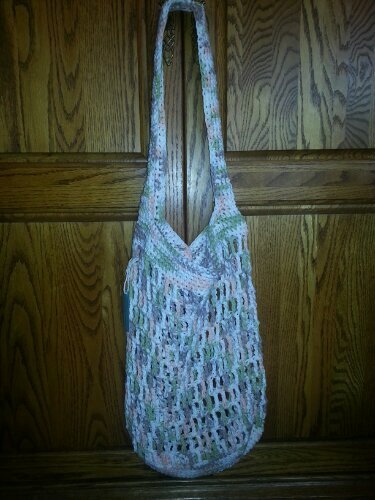 So, I browsed crochet sites and sifted through my stash to get some fresh ideas… A MARKET BAG… Yes, I have always wanted one and knew it would be easy and quick! I had plenty of cotton yarn to complete at least 1 or 2 bags! 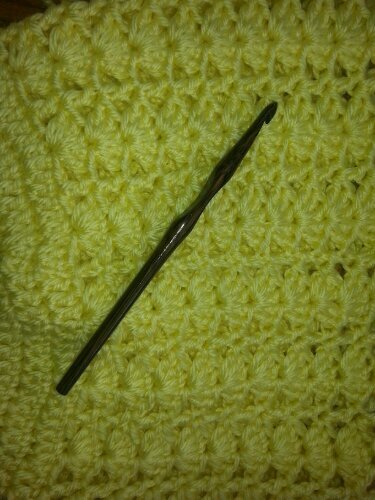 It has a solid Single Crochet bottom and Triple Crochet mesh sides. In just a couple of hours it was done… It is large, the picture doesn’t do it justice! The bag itself is about 18″-20″ tall the base is 12″-14″ across. From my shoulder it hangs mid-thigh with nothing in it… Perfect for a big shopping trip… It would bring home a lot of yarn! But like most crocheter’s, I decided to not keep this great creation… So off it goes to Alpine Originals for some other lucky shopper! I couldn’t just make one of course… So, the base of a coral one is already started! Spring is on its way, and a little sunshine will be nice. 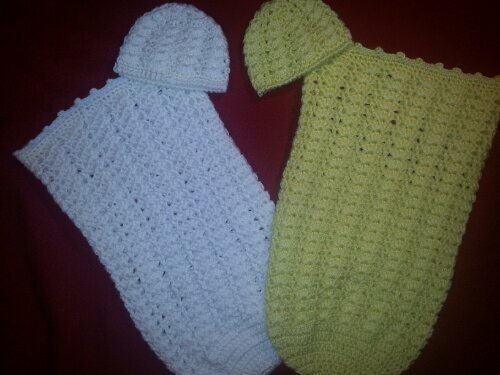 I completed my next pattern over the weekend and made two sample sets… I am hoping I got all the little quirks worked out and I will be posting the free pattern later this week for these cute little baby Cocoon & Hat Sets. 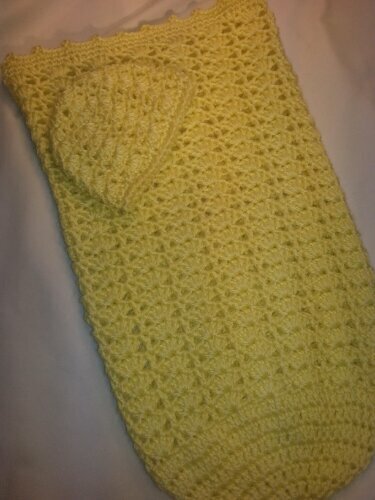 I tossed around the thought of what to call the pattern and since the sweet little yellow one was the first one completed, I decided to call them Shells & Sunshine Cocoon and Hat Set ! I will be carefully going over the pattern a couple more times to make sure it works before I post it. The pattern is simple and works up quickly. The set could be made up in just a few hours if you had a baby shower to go too! The set is for newborn – 3 months. These 2 sets will be delivered as usual to Alpine Originals to put up for sale. Like I was saying last post, they are participating later this month in the our city’s Art Walk… The display they have this month is focusing on artists with children’s items. So… I have been working at record speed to make several items that fit in that category! Don’t forget to check back later this week for the Free Pattern for this set… I hope you love it and I would love to hear from you when you make it! 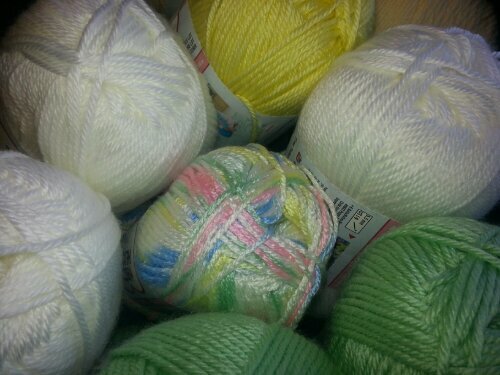 So here is to Spring and Sunshine… And Celebrating National Crochet Month!